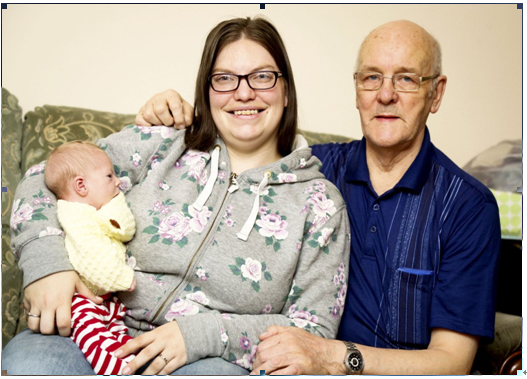 One of Britain’soldest dads is celebrating the birth of his second child with his wife PollyJackson D’zaccheus, who is 43 years younger than him. Coach driver JohnWillows, 73, first became a proud father on Christmas Day 2011. But the loved upcouple are now celebrating the arrival of new son David, who was born atLincoln County Hospital on November 21.They say that they are more in love thanever, and are now looking forward to Christmas with their new arrival. The couple are now looking forward totheir first Christmas together with their young son. 1. Where did the story happen? 2. How old is John Willows now? 3. John’s wife died 11 years ago because of_________. A Polly is 43 years younger than John. B They had the first baby in 2011. C Polly thinks John is a good father. D The children made John feel angry and sad. 5. You can see the passage in a_______.